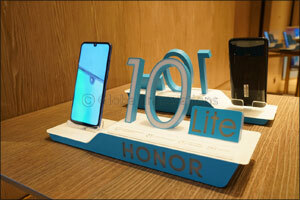 Dubai, UAE, December 18, 2018: HONOR, the leading smartphone e-brand under the Huawei Group, today launched the HONOR 10 Lite, the brand’s latest flagship smartphone in the Middle East, off the back of what has been a hugely successful year for HONOR. Inspired by the HONOR 10, the HONOR 10 Lite is set to bring together the best of today’s technology and set a new standard for smartphone design, with the stylish dewdrop notch on the 6.21” FHD screen and a body with vibrant gradient hues, and 24MP AI-Powered selfie camera and 13MP + 2MP dual rear cameras. It also features a 64MB internal storage. In the last 12 months alone, HONOR has increased its market share in the region by 378% in the United Arab Emirates and 195% in the Kingdom of Saudi Arabia – and is ending the year a high with its latest device, HONOR 10 Lite. Packed with powerful hardware at an unbelievable price, the HONOR 10 Lite, is set to take the lead over its competitors. Featuring a bezel-less display and artistic colors, the HONOR 10 Lite packs looks that will make heads turn. Boasting high end hardware with the most modern chipsets and cameras that can rival most modern smartphones, the new device provides users with an extraordinary, stylish mobile experience. The HONOR 10 Lite boasts stunning design complete with bezel-less displays and vibrant colors. Designed with 8 layers of shimmering material, the HONOR 10 Lite shines in four shades of gradient effects. The colours include Sky Blue, Shiny Red, Sapphire Blue and Midnight Black. While the former two have a gradual fade from light to dark and a luminescent progression effect, the latter two shows off a glossy texture with a chic and reflective look. To further add to its looks, the HONOR 10 Lite also comes with a dewdrop notch, that increases the screen-body ratio for a far better viewing experience. The HONOR 10 Lite also comes with a four-sided curved 3D design, giving it more rounded corners and a better overall grip. Packing the power of AI and high-powered camera hardware, the HONOR 10 Lite allows users to take professional photography, that can be taken with just one tap. Up front, the 24MP camera comes with a wide f/2.0, and increased resolution, creating the most beautiful selfies. The on-board AI also recognizes up to 8 different scenarios, finding the best settings for the perfect selfie. The camera also packs studio-like effects, for those finishing touches. On the rear, the HONOR 10 Lite comes with a dual lens setup of 13MP and 2MP, with f/1.8 and f/2.4 aperture. Pairing it up with the AI, and AIS, professional photos can be taking with ease, even under the most limited light. The HONOR 10 Lite packs the new Kirin 710, one of the most powerful chipsets in the market, which works with the flagship level Cortex-A73 core to provide smoother, seamless performance. In terms of storage, the HONOR comes with both 32GB and 64GB, offering users even more space in which to store their files. The HONOR 10 Lite is also suitable for gaming, thanks to the GPU Turbo 2.0, which is the future of graphics processing acceleration technology. With GPU Turbo 2.0, users are promised a better gaming experience, with a 36% reduction in input latency, and a much smoother performance overall. The HONOR 10 Lite is also powered by a massive 3,400 battery, promising longer usage time between charges. While the new EMUI 9.0 ensures that the system is completely optimized for the hardware while also boosting performance, it ensures that Artificial Intelligence is more accessible with HiVision, a travel, translation and shopping assistant. The AI-enabled mobile communication technology also increases the quality of calls, even in the noisiest of environments. The AI also makes sure that users will not get disconnected thanks to the new Elevator Mode. HONOR 10 Lite will be available in the Kingdom of Saudi Arabia and the United Arab Emirates on 20th December 2018. It will be priced of 749 SAR in KSA, and will be available in Jarir, Extra, Lulu, and in other phone shops. In the United Arab Emirates, the phone will be priced 799 AED and will be available at Carrefour, Axiom, Lulu, Jumbo, Emax, JollyChic, Sharaf and KM trading along with all mobile shops in UAE.